I decided to try out a bit of color blocking, maybe because I was accidentally inspired by Mila of Project Runway All Stars (Thursdays at 9PM EST on Lifetime, F Y I). Oops, forgot my leather leggings and robot gloves, you guys. The pattern is from the Spring 2012 McCall's collection, M6503, view D (the solid blue/denim dress on the bottom row). Obvi I left mine sleeveless. What is with the pink floral ruffle nonsense? Glad they threw a tasteful one in there or else I would've gagged right on past this pattern. I'm totally into dresses that button down the front bodice and are fitted in the waist (surprise). I saw a million at Target last night and had to pry my grubby paws off 'em all. Except for one that made me actually squeal in delight, so I purchased it. Let's just say it received the "squeal" of approval. I digress. I added an inch to the bodice, underlined the white fabric, and lined the skirt. I used larger buttons than the pattern called for, but they matched the colors perfectly and I thought the effect would be cute. Sorry, I've gone Picnik collage crazy. Just so you know, the bodice of this dress has ample room in the chest due to all the gathers. From the side it definitely looks like I've, uh, expanded A LOT in that area. Don't be fooled! Or, do be fooled. 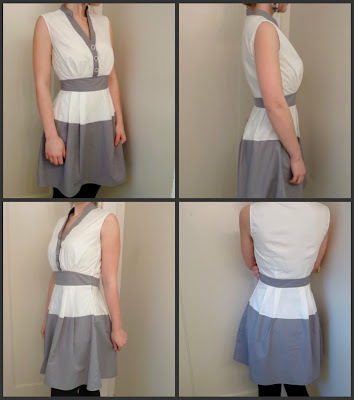 I used the gray fabric on the front band, collar and midriff. I marked the skirt pieces in even thirds and decided to use white on the top third only. I did trim it down a bit so the dividing line would be a little higher than the absolute widest part of my hips, though it's still pretty close. It seems to work okay on a full skirt like this. I'm unsure why this pattern calls for a regular zipper on the side. Even if I had had a white zipper on hand, I think it'd still look messy. Or maybe my zipper application skills are just really messy (I won't deny). Friends, if you make this pattern, I recommend you use an invisible zip. I also recommend having the zipper meet the top of the side seam, instead of two inches down, so you can step into the dress instead of having to maneuver it over your classy updo. This is bad news bears for those of us who live in apartments where you can't control your thermostat and so dry heat constantly blasts out of your vents, giving you the uncontrollable static head o' hair. I hate when other people think of questionably good puns before I do. "Best thing I've ever sewn" could mean many things, and certainly this wouldn't meet everyone's criteria, but my navy blue knit half-circle skirt is definitely the most versatile thing I've sewn, not to mention economical, comfortable, easy. All those things combined, for me, make it the best. It took me maybe an hour from start to finish. That's crazy. An HOUR. I spend more time each day reading Damn You Autocorrect. Why don't I make more half-circle skirts? Ooh, that gives me an idea for how to celebrate Pi Day this year (3/14). A couple weekends ago I took an inventory of my entire wardrobe, or at least the things that can be worn in public and weren't in the laundry hamper at the time. I even took pictures of most everything (just on hangers, not on me, geez), which was tedious but helped me get a birds-eye visual of what I have and what goes together and what I need. Some good did come of it; TWENTY-FOUR of the items previously hanging in my closet have since been designated to the "consign or donate" pile. Yikes. But perhaps most importantly, I realized how many tops I have that weren't worn very often because they were missing a common denominator. So once I figured out what that was, I made it. This navy blue knit skirt is that one piece that brings it all together, and here's a small sampling of how far this bad boy can extend into my wardrobe. I'm sure you're aware by now that when it comes to my apparel I don't pay much attention to these things you people like to call "seasons." I do own some sweaters, actually, but they're monochromatic neutrals and not as fun to photograph. I'm actually surprised by how many floral prints I own. When'd I get so girly? This knit fabric was the only thing not on sale at Hancock Fabrics the other week, but I bought it anyway because it was exactly what I was looking for: drapey, comfy, stretchy, navy, stable(y). It was 60" wide so I only bought one yard - $12.99, still not bad for the total cost of a skirt. I used Patty the Snug Bug's circle skirt calculator to help determine the radius and skirt length, then kinda followed this Online Fashion Courses video tutorial for making the pattern. I interfaced the waistband with self-fabric, and just serged it all right on up. My sewing-with-stretch-knits confidence is way up. I hope you're proud. The red/orange knit top in the first photo above is another recent creation. I made it by tracing a RTW shirt that's my go-to for casual wear. I think I found the original top in the juniors' section of Target; it's supposed to be a dress for a 13-year-old or something, but of course I wear it with legitimate pants. I did make my own version a smidge shorter than that so there's no confusion. I hate wearing jeans, but sometimes I have to because this is the American Midwest (or South, depending on who you’re asking) and it's pretty casual around here. I mean, I went to college in rural Ohio and I felt overdressed wearing a cardigan instead of a hooded sweatshirt to class. When I am forced to wear jeans (for what? I dunno, tree climbing? ), I feel more comfortable pairing them with a long sweater or top that covers the derrière. This fits the bill! The derrière bill, if you will. It has a wide scoop neckline in the front, a lower scoop in the back and elbow-length sleeves that (hopefully) draw attention to the shoulders instead of dem hipz. The fabric is a vintage polyester knit from Etsy (shop: EstateByRobin). Virtually unwrinkleable. Thanks, '70s! The shop owner described it as a "warm summer tomato red" though it does look quite orange, especially in photos. As long as it's not considered tangerine tango I'm cool with it. Have you tackled knits yet, or are you still wary of them? Knowing this crew, you've been fearlessly zig-zagging 'em up for years now. I'm glad I finally learned how to properly sew with them because they've already made some great garments. I'm also grateful for my serger (and the lovely parents who gifted it) for helping me take the leap. Andrea, dear, It's January 21st. Weather.com says it's currently 30°F ("Feels Like: 22°"). So why did you make a short-sleeve floral knit top today? Because the fabric arrived in the mail yesterday and it was just too freakin' ADORABLE to wait. Obviously. I wanted to attempt sewing with knits with my serger, so when I spotted 1.5 yards of this jersey on ebay for $7.50 (with free shipping) I snatched it up. I've been digging the orange-and-blue color combination lately, and I liked the scale of these flowers. The pattern is Simplicity 2594, view E -- the V-neck. 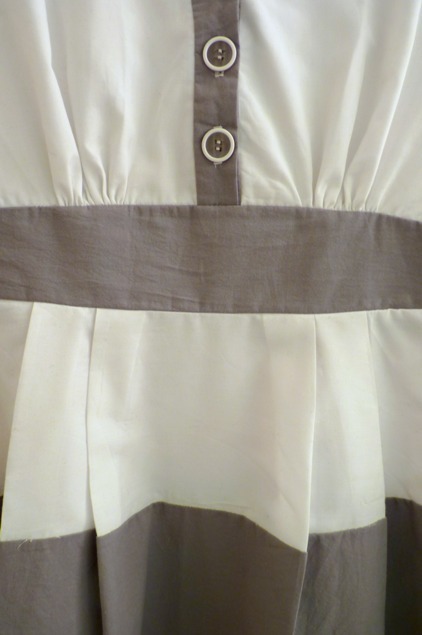 It has three pleats in the shoulder seam and gathers in the center back. Are you wondering why in the world I didn't make View D, the baby pink version with the enormous lace sleeves and neck ribbon? Oh, have to save that one for a real special occasion. This top was fast and easy to whip up. I took the advice of the million reviewers of the pattern and didn't even look at the confusing directions for attaching the back yoke/facing and just made it up. I guess they were trying to get you to encase all seams within the yoke facing, but I didn't bother. I didn't even bother to hem the bottom of the shirt because it doesn't fray and I'll only wear it tucked in. Hemming knits has always been a pretty miserable process for me anyway. So I made this unseasonal top today, but most of my sewing effort this past week went into making a muslin for the Colette Negroni men's shirt. When I re-picked up this sewing hobby not too long ago, my boyfriend immediately requested I make him a pair of chino pants. Yeah, welt pockets and a fly zip and belt loops and a perfect slim fit. SORRY HONEY BUT NO. I'm no TaylorTailor. OH WELL. Have you tried the Negroni for your honi yet? Oops, I made a Minoru. How'd that happen? I fully intended to participate in Tasia's Minoru Jacket sew-along, which begins on the Sewaholic blog on Monday the 16th. Darlings, I know that a sew-along means sewing along with your bloggery buddies so you can learn from one another and share your progress and, for once, not wallow in sorrow about how lonely it is to be the only one in your social group with a weird domestic hobby for grandmas-of-yore. But I just couldn't take the wait anymore. Sew-along I didn't; sew-alone I did. I bought this pattern when it was first released two months ago and I found an appropriate fabric right away, so I've been waiting forrrrrrever to start on it. As the date neared I thought, "Okay, I'll just get myself prepped, take my sweet time and approach everything with care." I did, too! (Meaning, I traced the pattern pieces and read the instructions ahead of time). But next thing I knew I had a finished jacket. I shortened the collar by about two inches, so it wouldn't stand as tall or flop open quite as wide when the jacket's unzipped. I also added exterior pockets since the pattern doesn't have them. I didn't think it through, though, and just used scrap fabric that was already shaped this way. Kind of weird-looking and not the most practical fit for my hands, but it'll do! There are two extra interior pockets, too, to hold even MORE stuff (most likely candy). I'm almost afraid to show you my lining because it is SHINY and BRIGHT CHERRY RED. Garish, you could say. I used flannel-backed satin for the lining, even though I'm pretty sure that's a fabric meant for bath robes. It feels luxurious, though, and adds a bit of warmth. I also like blinding people with it. The jacket fabric is another thrift store score: 4 yards of 60" wool in a tiny baby houndstooth pattern for $8. I think houndstooth looks more like the state of Texas than an actual hound's tooth, but you know me: always analyzing fabric in weird ways just to get a good Google Image out of it. The pattern instructions seem to assume some experience on the sewer's part but I was never confused about anything. My first fully lined jacket and I hardly blinked an eye. The elastic waist was kind of tricky to mark, place, weave through and stretch to fit, but it came out okay. Detail shot of the inside of the front exterior pockets. I lined it with the cherry shiny stuff, too. Detail shot of the hanging loop on the inside back. Minoru, you won't be able to handle this 18 degree weather, but I think we'll be alright friends in the end. If you haven't joined the sew-along but think you want to, there's still time. Tasia plans to have it wrapped up by mid-February, so even if you don't start on Monday I bet you'll be able to finish it by the end. This took me three evenings (and three bobbins - be warned, there's a lot of topstitching). Here's her page with all the Minoru tags so you can see all the related posts. *UPDATE: Mystery solved, guys. Tasia stopped by in the comments to clarify; it's pronounced Tass-e-ah. How beautiful! Here she is, my Darling Ranges dress. Ever since I saw Paunnet's version of this dress, I knew I wanted one. 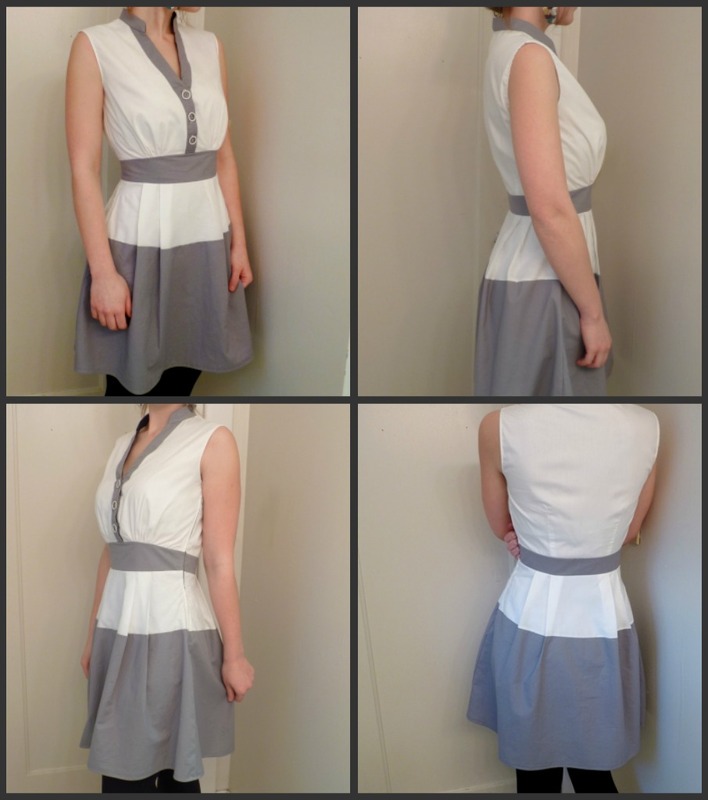 It's a nice little button-up V-neck dress with half-sleeves finished in elastic. Yea, we see you, center back crease. This pattern is by Megan Nielsen, an independent fashion designer and pattern-maker based in the USA. Most of her current patterns are for expecting mamas, but the Darling Ranges Dress is one primarily targeted at... non-mamas? No. Both mamas and non-mamas who just happen to not be... expecting? Why is that so difficult to write? I guess I don't know an appropriate word that means opposite of pregnant. Anyway, Megan designs and sells lovely clothing for cool people like you and me, so go check out her current winter collection. There's no facing in the bodice (a great thing), and I really liked the way the neckline is finished with bias tape. Yea, bias tape, my nemesis, but I can deal with it when it's only visible on the inside. The fabric I used is black and white rayon from ZinniaSnipSnap on Etsy. The floral pattern reminds me of those sunglasses-clad dancing flowers from the 90s. Now my Google search history is filled with terms like "battery-operated dancing wiggle flowers in sunglasses with tiny instruments." What else is new. They still make these things in Japan, of course -- the world capital of questionably cute and completely useless robotic toys. They're called "Flower Rock," in case you're interested. The pattern doesn't call for interfacing in the button placket. It just so happened that the day I was working on it, I received the Colette Patterns "Snippet" (weekly sewing tip) in my e-mail. It was about, guess what?, interfacing buttonholes. It said, "Not all patterns suggest interfacing buttonholes, but it's an important step to take [to prevent sagging]." I was like, "Is this a test?" So, I interfaced my buttonholes. I hope you're happy, Sarai! Okay, she seems pretty happy. Somehow I cut the bodice too short, so it's now kind of an empire-waisted dress. I'm not a fan of empire waists, so I'll mostly wear this dress with a thicker belt that creates the illusion of a lower waistline. This dress is comfy as all get-out, btw. The fabric isn't sheer, but since it's white I thought a skirt lining would be a good idea. Plus I'm sick of making unlined skirts that stick to my tights as I walk (mustard skirt, I'm talking to you). I simply cut the same skirt pattern in the lining fabric, stitched it together at the sides, then attached it to the skirt at the top when I machine-basted the gathering stitches. Hey, serged edges! My new serger and I have gotten along so far, but every time I go to Joann's they're always completely out of black and white serger thread. I was too anxious to get started on this dress so I just used the black I already had. It's probably a no-no on white fabric, but I don't think it's that noticeable from the right side. I want to make a sleeveless version in a darker color next! Tell me: is this pattern in your stash yet? Get on it!